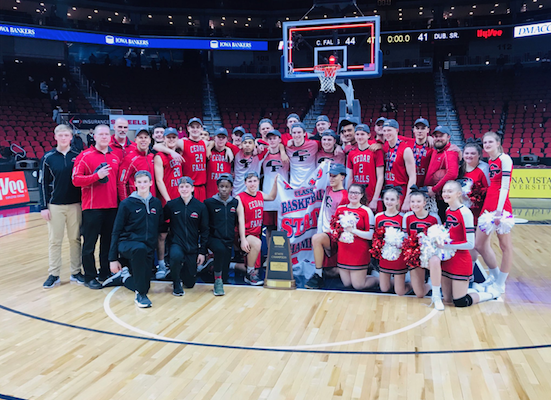 The Tigers won a 44-41 state championship victory over Dubuque Senior on Friday, March 1. This is the team’s second State Championship in a row. With 2 seconds left on the clock on the night of Friday, March 1, Dubuque Senior’s Noah Carter heaved up a shot that was blocked by the Tigers’ senior forward Jackson Frericks, handing Cedar Falls its second championship title in two years, 44-41. The Tigers had a very different post-season compared to last year, as their high scoring affairs were replaced with historic defensive battles. The Tigers held North Scott to just 27 points, which was the least amount of points allowed in a semi-final game since 1950. The team really enjoyed playing a defensive playstyle, especially against North Scott. “The best moment was winning a tough defensive game against North Scott. We had a huge fourth quarter to win that game,” Frericks said. The team faced challenges all year with having so many games cancelled because of weather, but the players were up to the challenge of the increased workload and more intense practices. Those practices paid off in the end with the team going into the playoffs extremely focused and ready for anything that would get thrown at them. The Tigers went into the playoffs knowing that they were the team to beat, no matter what they were ranked. Schultz said he is very proud of the team’s accountability and ability to stay focused throughout the year in order to win, and relates it to the team’s confidence. The key to the victories for the Tigers was to play as technically sound as possible and be more physical than their opponents. They wanted to turn good defense into easy offense. Even after the Tigers rolled into the championship game, their core principles did not change and they wanted to stick to their game plan. They would be facing one of the best players in the state in Carter of Dubuque Senior. Their main goal was to shut him down. “Our strategy was to make their best offensive players’ shots hard and to make their teammates beat us. Against Dubuque Senior, we needed to stop Noah Carter, so we doubled him when he got into the post,” Frericks said. After a rough start, the Tigers got into a zone and clawed their way back to eventually take the lead, but with a solid 8-point lead for the Tigers in the closing minutes, the Rams knocked down some crucial 3 pointers to take the lead by 1. Logan Wolf then scored a clutch bucket to put the Tigers back up by 1 with two seconds left on the clock. The Rams got the ball straight to Carter in the post, but two Tigers were able to get there and block the shot. The Rams were able to foul, but after Wolf knocked down both free throws, it would take a miracle shot to tie the game for the Rams. With less than a second left on the clock, the Rams chucked it from half court with no success. The Tigers had won the championship in a nail-biter.